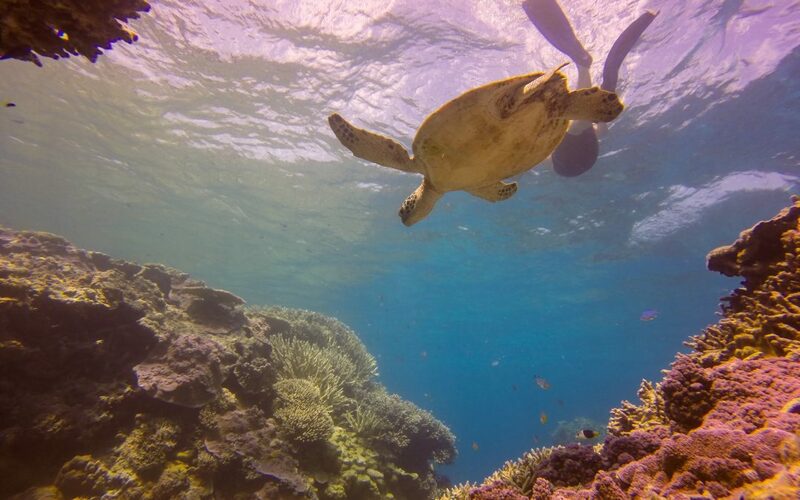 Come with us and visit one of the most beautiful ladies on the whole Great Barrier Reef. It’s absolutely true – Lady Musgrave Island – with clear, pristine waters of the lagoon, almost 10 kilometres of reef wall and embraced within her arms – the island itself. One of the best reasons to visit this area is the reef wall has a deep channel that allows vessels to enter into the safety of her arms within the lagoon. It will be the beginning of a new love affair that will draw you back to her time and time again. She truly is a special woman and a very special place. One that we are so lucky to enjoy as the world’s climatic conditions are changing around us, seriously impacting the largest living structure on this whole planet we call home. Snorkel the calm lagoon waters and view the coral and marine life at your leisure. Lady Musgrave Lagoon is surrounded by a coral wall that gives it the protection from the open waters of the sea, and makes it like a large swimming pool to snorkel in giving you a sense of safety as the Island is close Enjoy our guided island walk on the island itself. Truly an enchanted forest thrives here, reliant on only rain water for growth. If you come in summer, make sure your hat is on, the 10,000 Noddy Terns that call this place home for the breeding season are above you as you walk. And we all know what birds do, don’t we. Enjoy our glass bottom boat tour, gliding across the lagoon, learning about the different coral formations and the reef itself. See if you can spot Nemo or Dory on your way. The turtles like to hang out with us as well for the day, right near the boat, an easy snorkel to knock on their door and marvel in their company. you can watch all this above the water with our guide telling you about all the marine life below so that you can then Snorkel at your own pace and know what you have seen. During the Whale Season, we often enjoy encounters with these graceful giants of the sea. Sometimes, they like to play just over the reef wall, right where you are snorkel. Don’t worry – they won’t come inside. Other times we spot them are on the trip out and back. Remembering of course, if they are right there next to us, you’ll get the best viewing, as the vessel may drift along with them until they flap their pectoral fin and wave us goodbye. Sound all too good to be true – well it’s not. Come with #1770reef to visit the most beautiful Lady in the world – Lady Musgrave Island, Lagoon and Reef.